This is not an amateur radio equipment. Please inquire to your dealer for details of this product. 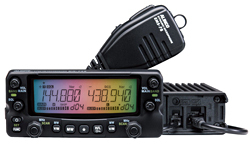 An Exciting New DMR Radio that's available to all! This Alinco's DMR transceiver packs a lot of performance into a compact and rugged polycarbonate body. Designed to resist dust and splash, the DJ-MD40 features specs such as 1W audio output with a large speaker and 2.5ppm frequency stability. Capable of operating 5W output in analog and digital with mixed mode,1000 channels programmable in 64ch per zone in a hotel, shopping mall, theme-park, exhibition hall for business, construction, factory, warehouse, stadium where communication comes first, the DJ-MD40 is a brilliant choice for everyone! This "beautifully simple" radio has fully independent keys and dials to deliver true dual-band operation. The removable front panel can be remotely mounted or inverted for optimal speaker placement. 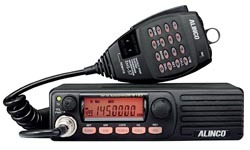 Building on Alinco's reputation for simple operating commands and straight-forward key design, the DR-735 is a radio you can start enjoying from the moment you power up! 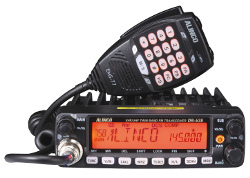 The DR-638 dual-band transceiver from Alinco makes a sharp attractive addition to any operating environment. Starting with full duplex capability and a remotely mountable control head, the DR-638 is a solid performer for base or mobile operation. Best Value, Proven Reliability and Feature packed! The DR-138/438 is a high technology radio that delivers power and performance in a small package. User-friendly configuration and programmable features make the DR-138/438 the radio of choice for both demanding and beginner operators. The DR-B185 in its compact package is loaded with high technology features: high stability PLL synthesizer, newly designed power circuit that puts out 85W max, 7-digit alphanumeric display, a wide variety of scanning features, just to name a few. Yet the operation is intuitive and simple with user-friendly configuration. Using a high-tech, high-powered radio is this simple! compact size, and full featured! Full of advanced features, the DJ-500 offers landmobile-grade operation and powerful 5W output. CTCSS, DTMF, DCS and 5-tones are standard, along with a variety of tone bursts for repeater access or selective calling. Convenience features include direct frequency input, alphanumeric channel labels and 200 memory channels that can each store operating parameters. A Li-Ion battery pack and a stand charger are standard, adding power and convenience. The DJ-500 looks simple, but remember, looks can be deceiving! The DJ-500 places one of the world's most advanced transceivers at your command, at ALINCO's affordable price! This announcement has been made in accord with requirements of the State of California. However, it is recommended for all users of our products to read it for health and safety of yourself and the environment around you.